A common skeletal disorder, Osteoporosis causes one’s bones to lose their natural strength and be subject to a higher risk of fracturing, and inability to support one’s body weight, or in other words, when bone tissue deteriorate faster than it’s replaced. This disorder is much more rampant in individuals over the age of 50, due to a lower bone mass and bone quality. However, men and women of any age can be diagnosed with it. In fact, over two million Canadians have been diagnosed with osteoporosis. Women at their menopause phase have an increased risk of having this disorder due to their bodies no longer producing the estrogen hormone, which is a major factor that helps to maintain bone strength. Most common in woman reaching their menopause phase. This type has no ‘direct cause’ or origin, but rather occurs as we age, and rapidly occurs at menopause. This type can occur in younger and middle-aged individuals as well as seniors, and is typically caused by use of various medications such as corticosteroids, malnutrition, too much exercise, or chronic illnesses such as anorexia nervosa. This doesn’t necessarily mean exercise is bad, but some woman who exercise excessively have a chance of losing their menstrual cycle, which causes their ovaries to stop the normal production of estrogen. Osteoporotic fractures often occur in the forearm, hip, or vertebrae, but it can happen to any bone structure including the pelvis, ribs, etc. Vertebrae fractures also lead to back pain, decrease in height, and possibly functional impairment, meaning the inability to function in a specific part of the body. 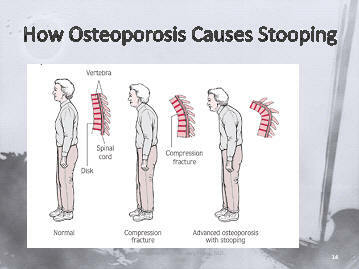 However, other than fractures and chronic back pains, osteoporosis has no directly noticeable symptoms. The back pains can happen standing still, and worsen when performing everyday activities, or even sneezing and coughing. Are you at a Higher Risk of getting Osteoporosis? As mentioned before, the drop in estrogen levels during menopause in women is a huge risk factor leading to osteoporosis, but there are other risk factors, some controllable, and others not. Like with most common disorders that happen with age, leading an active and healthy lifestyle is an excellent way to prevent Osteoporosis. Eating foods that are rich in vitamin D and calcium are great ways to counteract deteriorating bone quality as we age, because our bones are made up of calcium and influenced by vitamin D levels. It is recommended to check up with your doctor frequently as you reach your senior years, especially if your feel more frequent back pain daily. Osteomalacia and Osteoporosis – What is the difference?